In one of the economy's more impressive comeback stories, U.S. March exports reached a new all-time high, after growing at a 15% annual rate for most of the past year. 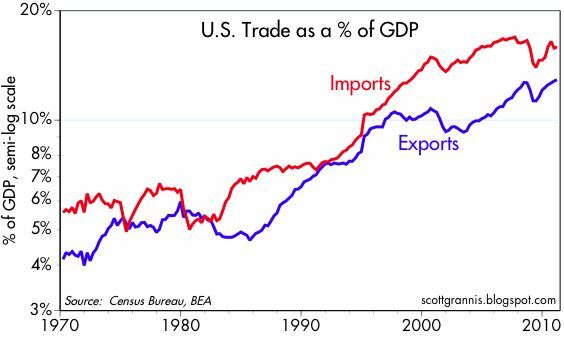 Exports now equal almost 13% of GDP, and that's up a staggering amount since the mid-1980s, when they were only about 5% of GDP. 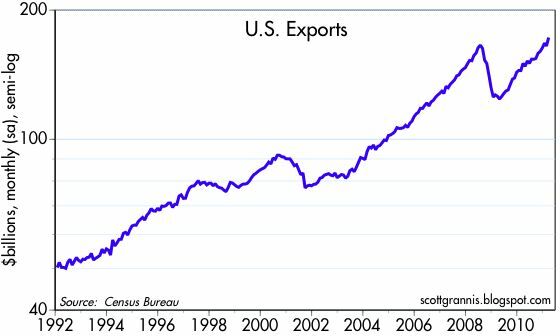 Moreover, exports have grown faster than imports since 2004, cutting the trade gap almost in half, from 5.9% of GDP to today's 3.0%. Mark Perry has some interesting facts on the fastest-growing area of exports—manufacturing—here. This may be a good place to note that if the Chinese and other major holders of U.S. debt wish to second-guess their decision to park significant sums of money in our economy, then the withdrawal of that money from our economy can only happen via a significant—and further—increase in our exports of goods and services. After all, the large trade gap that the U.S. has experienced for the past 20 years occurred thanks to an equally large capital inflow; foreigners decided that they wanted to save and invest a portion of their export earnings in our economy, rather than buy our goods and services. So any new capital outflows must be matched by an equal increase in the purchase of our goods and services. The only thing off putting to owning stocks at this moment is yesterday's comment by Bill McKibbin stating now is the time to buy stocks. 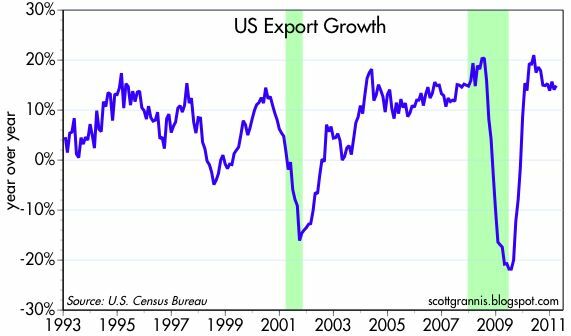 We could very well see an extended, secular boom in exports if the dollar stays in a trade-enhancing exchange rate, and global growth continues, both of which are likely. Ergo, hold onto your hats. We likely have come old-fashioned boomtimes ahead. If enough credit stimulated 'trade-enhancing' fiat 'promise to repay' dollars are printed ... the secular boom may very well go thru the roof in the short term. This is encouraging news. The only way out of the doldrums is growth in net exports. Other paths to recovery are shut off - construction, government, private consumption and most forms of investment.